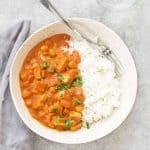 Slow Cooker Vegan Tikka Masala! This slow cooker meal is SO good and perfect for healthy weeknight dinners. If you love indian food, then you’ll love this simple dish. Chickpeas and tofu in a fragrant tomato-coconut sauce. Lightly grease the inside of your slow cooker with a bit of olive oil or spray and set aside. Combine all ingredients from onion to salt together until well-combined. Place the tofu and chickpeas in the base of the slow cooker and pour the sauce ontop. Gently mix together until everything is combined, making sure the tofu and chickpeas are well coated. Add in the lemon juice and stir once more before serving. I love this on steamed rice, some naan and maybe a little extra chopped cilantro! This makes 4 large servings or 6 normal servings, especially if you are serving with rice and naan. But! Leftovers can be stored in an airtight container in the fridge for up to 5 days, and the leftovers are so good for lunch.